Chennai Express is the very first preview show movie for which I ventured, with my kid, on Thursday . We reached the Multiplex with time in hand to discover that the show was almost Housefull! There were fans like me who have waited too long for the movie to release, wanting to watch it and form their own reactions before the rest of the world does! Chennai Express is the story of a 40 year old Punjabi man named Rahul (Shah Rukh Khan), who needs to fulfill the last wish of his grandfather and immerse the former’s ashes in Rameshwaram as per a request of his grandmother (Kamini Kaushal). He sets out from Mumbai on the Chennai Express to befool her, but later realizes that the joke is on him. His Goa-trip plan with his friends goes awry as he literally helps Meena Lochni Azhagasundaram (Deepika Padukone) to hop on the train a la DDLJ style. But, he also helps four hefty men ( her cousins) who are following her! Meena is the “bada twist” who changes his life. Meena is the daughter of a local Don (Sathyaraj) of Kumban village with wide Southern influence. Turns out that Meena is on the run as she doesn’t wish to marry her 'Appa-ke-Friend-ka-Beta', Thangabali (Niketan Dheer), a groom her father has fixed to better his power quotient. (Meena claims- “Bhaagne mein mera bahut experience hai!”) She concocts a tale with 3 untruths that she’s in love with Rahul. Needless to say, what began as lies, becomes the truth later! But, Rahul is even ready to change his nationality to avoid the Kumban village! What happens next? How is Rahul’s journey? Is he successful in completing the task at Rameshwaram? Does Meena get what she wants? Does her father oblige? What are the twists and turns of this story? All is well that ends well with the ultimate aim- ‘Kalyanam!’ (Marriage) as the Don acknowledges that Rahul is the “REAL Man”. “You Win- Meena Tera”, he says. That’s when I felt that Meena is an ‘item’ that can be won! In an earlier scene, to save his life, Rahul is ready to hand over the ‘item’ to Thangabali. But, now he cutely asks her consent for Kalyanam! It also has great acting by all the characters especially the lead actors- Deepika and SRK. I felt this was Deepika Padukone's one of the finest roles. She is emerging from strength to strength with touching performances. The songs with Vishal-Sekhar’s music are already making waves! I noticed that after Rahul’s Nokia Lumia 920 loss, Chennai Express has no touch with any technology. No computer or cellphone anywhere in the picture, just traditions and village-life! Chennai Express is a simple, honest, neat and clean movie in which the power of the common man wins! We can watch it with the whole family. I loved the choice of the locations where the Chennai Express movie has been shot- lush greenery, nice scenery, superb aerial views, authentic look and feel village-setting. Loved the dialogues, witty-one-liners, humour, performances & cinematography, picturisation. Rahul says- My name is Rahul & I’m not a Terrorist! Rahul upholds values and does not run away with Meena! Proves himself to be worthy of her and earns her hand! Chennai Express echoes current sentiments. Climax Scene has reference about the ‘66th Year of Independence’ and taking daughters’ ‘Marzi & Khushi’ (consent & happiness) into consideration. Chennai Express is a typical Masala Film with Action-Comedy-Romance-Emotions-Drama in good proportions! It's a fun roller-coaster ride! Meena heading inside the home to get Rahul's grandfather's ashes. - Lots of Tamil without Sub-titles- Though Meenamma & Inspector Samsher do the translating in some scenes, there are many scenes in which I wished there were sub-titles on screen. - Lots of power-packed action in the Climax- Rahul is shown to be mercilessly beaten up & crashed into so many stalls and vehicles by Thangabali. - TTE getting shockingly thrown out of the train- Why throw the TTE out at all? Later, I thanked God that he was safe. - I was disappointed with Rahul’s initial attitude towards his grandparents. Imagine planning to immerse the Ashes in a river in Goa that would ultimately carry it to Rameshwaram! Luckily, Meena’s responsible nature and sensible talks brings about the change in him to do the right thing, just as per his grandparents wish. I loved it when Meena responsibly collected the Ashes-container. Travel light on Chennai Express without carrying any load or baggage & just sit back, relax and enjoy the journey! You are guaranteed to cover miles with action & smiles! 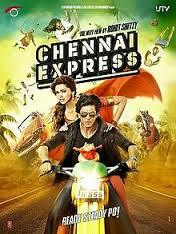 Have you boarded the Chennai Express yet? Come on, Ready, Steady, Po! This has my views of Chennai Express. If you liked this post and my Blog, request you to please post comments below and do follow my Blog! Click on the 'Join This Site' Button just to your right, on this page. Thanks! Thanks for liking my review, Sushmitha. Do watch! You'll enjoy this fun-package! No waste! Paisa Vasool! You will enjoy. Just travel light! The every fact that it has garnered the quickest 100 crores in the opening weekend itself, raises its bar! it was a good read indeed, after i saw this movie 1st day itself and loved it, may be not one of the best movies i have seen but throughly enjoyabale.